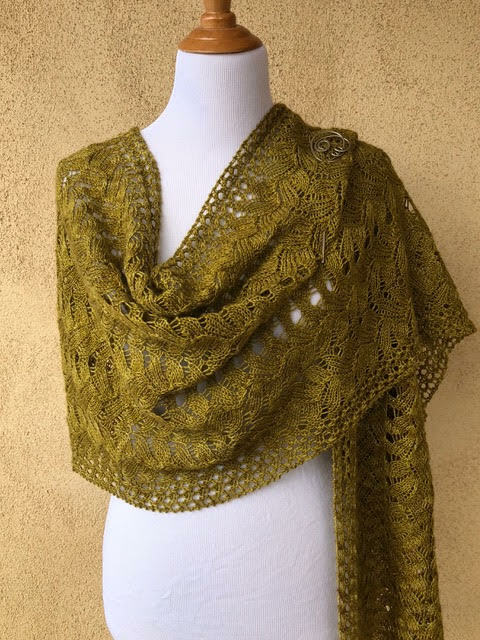 Claudia Donnelly just released her newest pattern, Riverton, in Anzula Lunaris in Frankie. Cue gratuitous pattern pictures! Isn't it just beautiful? We thought it was a good time to spend a little time getting to know her! We hope you'll enjoy our chat. (If you like cats or yarny tattoos, I recommend reading to the end). 1) How did you discover Anzula Yarns? I was in Columbus, Ohio for my 25th HS Reunion in October of 2015 and had set up a time to do a trunk show at “Yarn It & Haberdashery” yarnitanddash.com in Grandview, OH while I was there. It was at Esther Hall’s lovely shop that I discovered your yarn. She had lots of it there and well, some of it had to come home with me! With red (in every shade) my favorite color, this was what came home with me!! 2) When did you start knitting? How did you learn? I grew up in a house where fiber was everywhere in just about every form. My mother was a knitter, spinner, and natural dyer. Even though I grew up surrounded by fiber, the knitting bug didn’t bite me until much much later in my life. When I moved to Albuquerque, NM from Tucson, AZ in June of 2008 I approached my Mom about teaching me how to knit. I had been hearing about the groups of women that she knit with on a regular basis and the incredible friendships she had built that had helped her through good times and bad (the sudden death of my only brother) and I really wanted to be a part of that. I knew nothing about how to knit but I knew it was something I wanted to share with my Mother. I wanted to have something that she and I could do together. I had always been a “crafty" person and had designed other craft projects in the past. When I started knitting, it was like finding out I’d always been an artist, yet for the first time, I had just discovered the true medium with which I was supposed to be working in all along. It was a revelation for me for sure. 4) What inspired you to design Riverton? When the “Japanese Knitting Stitch Bible; 260 Exquisite Patterns by Hitomi Shida” was released in 2017, I could not wait to design a shawl with these perfectly delicate stitch designs. Looking through the book was like looking through a coffee table art book, it was simply stunning. It didn’t take me long to start swatching! A collaboration with Anzula Luxury Fibers, Riverton is my first exploration into using Japanese stitch patterns and variations to create an exquisite rectangular shawl with timeless movement and fluidity. I knew the second I opened up the book that I would be playing around with and designing pieces using these incredible stitch patterns. Mom and I had the book on pre-order for 5 or 6 months. When it arrived in the mail it was like Christmas. We each used different colored post its to mark our immediate favorites we knew we would want to play with. The pattern used in the body of Riverton was one of the first patterns I marked. The the stitch pattern used along the long sides of the shawl is generally intended for work that isn’t heavily blocked. I wondered what it would be like to take that pattern, use it, then block the daylights out of it and see what happens. I loved what I saw as it made a perfect edging. 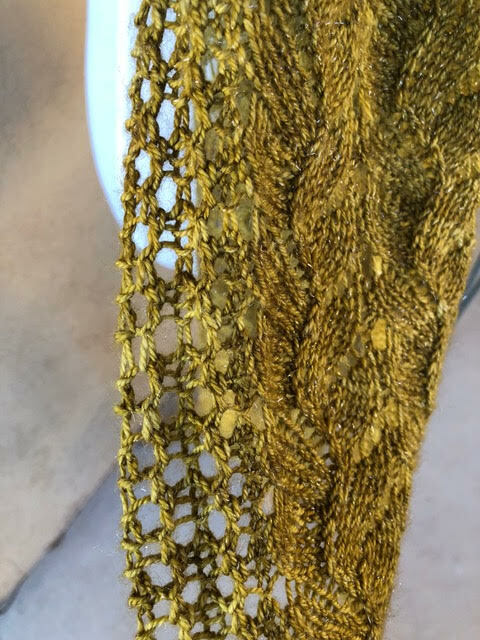 You get a whole different level of results when you take a stitch pattern intended for a sweater or something that won’t really be blocked and use it in lace. I love it! When I contacted Anzula and asked if they wanted to collaborate they were excited to do so and asked me to work with their Lunaris base. I chose the color Frankie because I LOVE mossy, yellowy greens. And the Lunaris base has a bit of stellina in it which made it all that much better. I hadn’t yet designed anything with stellina so I was very excited. When they sent me the yarn I almost couldnt believe just how beautiful it was1 The color easily mimicked the moss and leaves you might see along the side of a little river or brook somewhere in the mountains. Turning to the book, one of the first patterns I marked was the one I knew was perfect for this design and this yarn. Riverton is intended to mimic flowing water and the stellina really adds to this affect beautifully by looking like sparkling water. The marriage of yarn and design were perfect to me. I hope others like it too! 5) Do you do other fiber crafts? Oddly enough, not really. Knitting and designing is where its at for me! I have done some bead work in the past but thats about it. 6) What lead you to start designing? My mother had the complete set of Barbara Walkers "Treasury of Knitting Patterns” and I remember going thru the first one completely wide eyed and in complete awe shortly after I started knitting. I remember saying to my Mom…”you mean you can put this…with this…and this…and design your own piece?” And she looked at me and said “absolutely! You can do whatever you want with them!” The first book in that series sparked something in me. The book is blue and has an AMAZING pattern on the front cover. I’ll never forget that feeling of realizing I could literally do whatever I wanted with design. My favorite designers tend to be ones who do completely different stuff than I do. Especially garments. I don’t knit garments, except for babies and children, and I certainly don’t design garments! Some of my favorite garment designers are Joji Locatelli, Laura Nelkin, Taiga Hilliard, Carina Spencer, Veera Valimaki, and Thea Coleman. 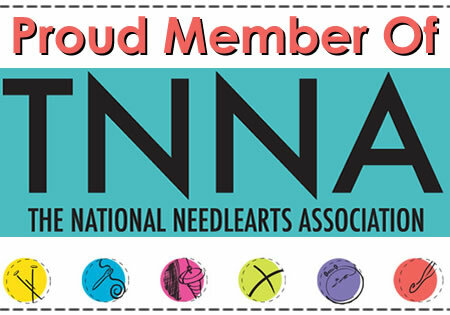 For shawls I really admire Josh Ryks-Robinsky (Geoknittrix designs), Anne Podlesak, Andrea Mowry, Stephen West, and Kay The Arky Designs (Kay Smith…and yes I know she’s my mother) but she and these others I’ve listed do very different things than what I do and I truly admire that. Josh Ryks-Robinsky’s sense of color and texture are really fantastic. I want to knit his entire collection. I can’t imagine how he comes up with his designs! Color and yarn are HUGE inspirations for me. I’ve had my head in so many design books that when I see color and different yarns I tend to look at them and think..well, this pattern or that pattern would go SO well with this yarn. But I also love nature and the elements that you can find there too. There are so many things that inspire me from color, to yarn, nature and even emotion! I have one cat, a rescue, named Audrey Grace. She is a long haired tuxedo girl and is an only cat as she doesn’t get along well with other animals. She was adopted out from the Humane Society twice and returned both times because she was adopted into a situation with other animals. She most definitely needs to be the only princess of the house. And she is! She is absolutely spoiled rotten. But the love she gives us in return is ten fold. She isn’t just a pet, she is a family member. She is a person in a little furry suit. When she sits, she does so with her paws crossed. She is treated like royalty and acts like it in return! I LOVE tea but I tend to drink more coffee. If I’m not feeling well or just really want the feeling of coziness, I will make a pot of tea. We have a lovely tea house here in Albuquerque that I LOVE to go to; the St. James Tearoom. Most of my recent love affairs with tea are as a result of the time spent at the St. James having formal tea. Both. I do not discriminate. I love cake as much as I do the pastry of pie! 11) Tell us about your favorite yarn shop? I tend to not discriminate here either. I love ALL yarn shops. But probably my favorite yarn shop is Yarn & Coffee in Santa Fe, NM. Certainly since our home yarn shop, Village Wools, closed a couple years ago after almost 45 years in business. For that homey and neighborhood feeling now, we get that at Yarn & Coffee. You can check them out at yarnandcoffee.com Deborah Grossman, the owner, has such a wonderful selection of anything and everything a crafter could possibly want or need for their crafting needs. From an amazing selection of popular and local yarns, to unique craft bags from www.blueq.com There is plenty of room to sit down on either of her sofas or chairs in the knitting nook as well. Deborah is very knowledgable when it comes to the industry and her shop. She serves coffee and tea up as well, making whatever you are doing at her shop a super cozy experience. She has always been so supportive of my work and has hosted several trunk shows for me, the latest of which was just this past weekend with the release of Riverton. If you’re ever in the area I highly recommend stopping by. There is a special front area which is AWESOME and perfect for trunk shows for designers or yarn dyers! There is plenty of room to set up shop and stay a while! Contact Deborah if this interests you! Here is a pic of my knitting tattoo. Because knitting and designing is a huge part of who I am and what I do, I had to have it tattooed on me. I have many others on my arms now but my knitting tattoo was the first. In it are the Brittany needles I used in my first knitting project, and red yarn. My favorite color! The wrist says knit and purl depending on how you are looking at it. There are pictures showing each perspective.